Since 2000 we've represented Earth Chain in Northern California and Northern Nevada. They are a leading manufacturer of magnetic workholding, work handling and deburring products headquartered in Indianapolis, IN. 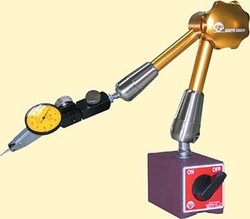 Established in 1988, Earth-Chain Enterprise Co., Ltd. is a professional manufacturer of magnetic tools. The MagVise Magnetic Workholding ‘Electro-Permanent Magnetic Chuck EEPM Series’, and Permanent Lifting Magnets ELM Series are made with ISO 9001 and CE Certification as well as over 30 patents. 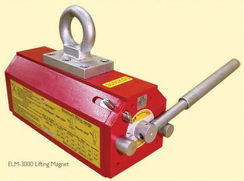 Use the EZ-LIFT magnetic lifters to move plate steel, block or round steel, and iron material in your shop. Super-powerful "rare earth" neodymium iron boron magnet requires no electricity to perform material lifting. It’s perfect for loading or unloading most workpieces including press molds, plastic molds, machined parts, etc. Micro Deburring MachineThe sPINner small parts deburring machine eliminates costly hand deburring of small, precision parts. Special micro deburring media magnetically removes fine burrs fast. 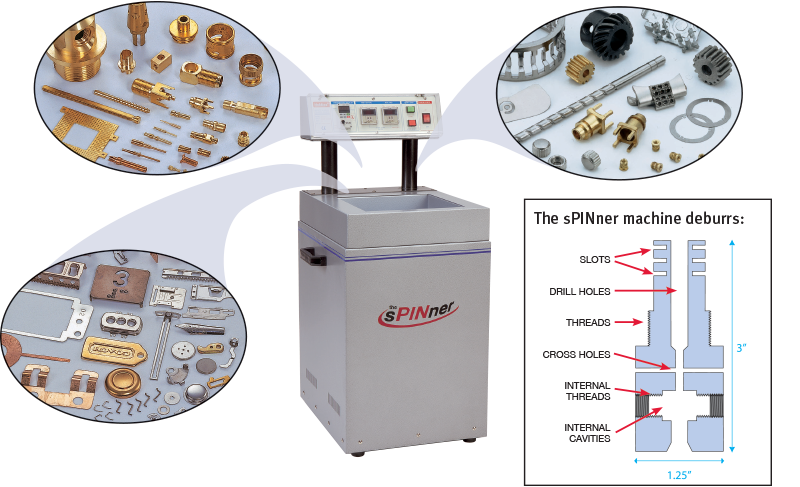 The sPINner deburrs slots, inner diameters, and cavities no otherdeburring equipment can reach. Follow Next Generation Tooling's board Earth Chain on Pinterest. 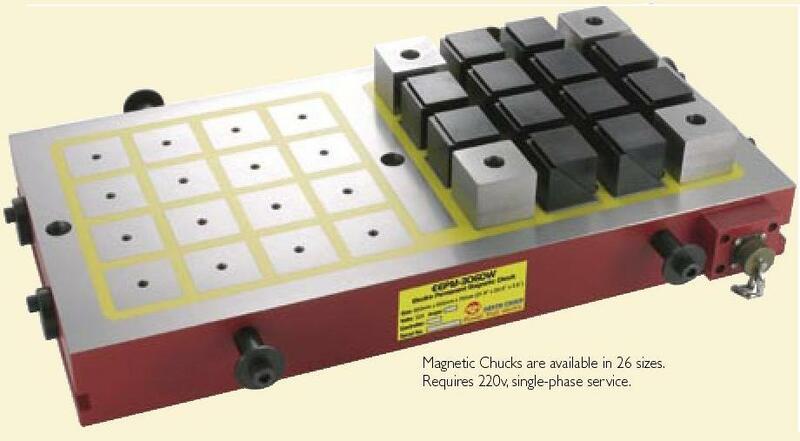 Use a MagVISE array to easily create custom magnetic workholding for large jobs and/or multiple workpieces. You can even hold a variety of different size and shaped workpieces all with one set-up. It’s easy to perform complex 5-sided machining using the MagVISE. You can even machine on 5 sides while holding a large number of workpieces using an array of MagVISE blocks. The machinable soft jaws permit workpiece nesting for improved accuracy over other workholding systems. Also, you can machine right through the part without affecting the workholding. The electro permanent magnetic chucks are used for normal and heavy duty drilling, milling, and boring operations on medium or large sized work pieces. Rough and uneven stock is no problem to hold. Simply use the sliding pole extensions to support uneven work pieces. A minimum of 4 alternate poles contact is necessary for optimum magnetic holding power. Minimum thickness of job- 1/2". EEPM magnetic workholding chucks drastically reduce set up time while maintaining uniform electro permanent holding power over the entire work piece. 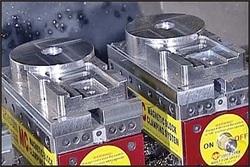 Since work piece distortion does not occur, tool chatter is minimized and surface finish and tool life are improved. No electricity is needed to keep the EEPM chuck ON,… the magnet keeps on holding tight even during a complete power loss. Easily integrated with pallet changing and FMS Systems. Each arm features fast "One Twist"*, 360˚ adjustable design, and powerful magnetic base. Check out our new ECE-CSP310 Chip guard and print holder. *"One Twist" not available on ECE-302BL. Hydraulic arms are faster, stronger, and more precise than mechanical joints. "A manufacturer of credit card scanner parts makes small, intricate stampings out of 304 stainless steel. The stamping process left burrs on the bottom of the part. Due to the thickness of the part, about .015”, traditional methods such as tumbling often damaged the part by bending them." "Even the smallest burrs were not acceptable for this critical tolerance (0.0001” air motor. The company had an opportunity to diversify into the medical industry, manufacturing an air motor for a biopsy device that takes breast tissue samples for diagnostic analysis. Metal burrs left over from the manufacturing process were a part quality problem that had to be solved before they could move ahead with the project."